I worship azhagiya maNavALa mAmunigaL who is the target of thirumalai AzhwAr’s mercy, who is an ocean of auspicious qualities such as knowledge, devotion, etc. and who is greatly attached to yathIndhra (srI rAmAnuja). I surrender unto the lotus feet of srI rAmAnuja (emperumAnAr) who is very attached to the golden lotus feet of srIman nArAyaNan and who thus considers everything else as a piece of grass (insignificant), who is my AchArya and who is an ocean of mercy and all other most auspicious qualities. I worship yAmunAchAryar by whose mercy my defects have been removed and I have become an identifiable object, i.e., previously I was like asath (matter) and now I have realized that I am sath (soul) after meditating on the lotus feet of yAmunAchAryar. I bow down at the lotus feet of nammAzhwAr whose lotus feet are always the mother, father, children, wealth and everything else and who is the leader of our srIvaishNava community and such lotus feet are decorated with maghizha flowers and always radiantly glowing. I reach out to srI ranganAthan who is a beautiful ornament decorating srI mahAlakshmi’s breasts, who is a great radiance himself, who is resting in srI rangam and who is like a crown jewel on the lap of Adhi sEshan. bhagavath gIthA is the world renowned vaidhika (vEdhic) scripture which was spoken by srIman nArAyaNan himself. srIman nArAyaNan himself descended as krishNa and explained the real essence of vEdhAntham in gIthA. 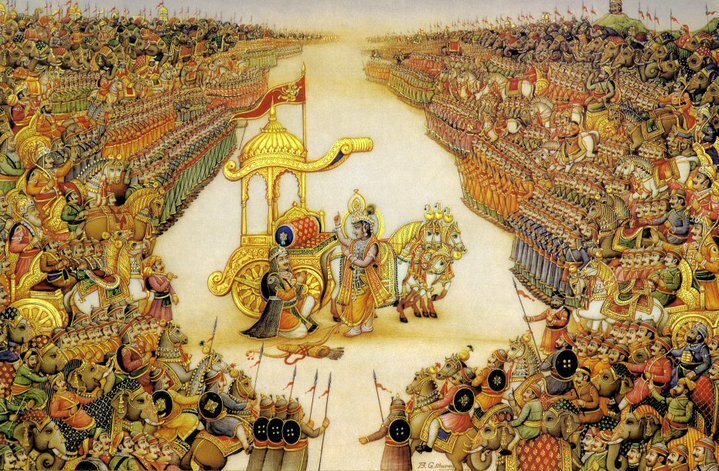 In the battlefield of kurukshEthra, when arjuna became perplexed on thinking about fighting his own kith and kin, krishNa assumed the position of an AchArya (spiritual preceptor), explained the truth to arjuna and convinced him to fight the adharma (unrighteousness). It is because of this gesture of him, krishNa is famously known as gIthAchArya. All the upanishaths are cows. The cow-herd boy who milks the cows is krishNa. arjuna is the calf. The wise are the ones who drink the (sweet) milk. The sweet gIthA is the milk. The most celebrated charama slOkam – gIthA 18.66 “sarvadharmAn parithyajya mAm Ekam saraNam vraja | aham thvA sarvapApEbhyO mOkshayishAmi mA sucha: ||” carries the most important message of srIvaishNava sath sampradhAyam – that is, bhagavAn is the only means to attain him (and kainkaryam at his lotus feet is the goal to be attained). 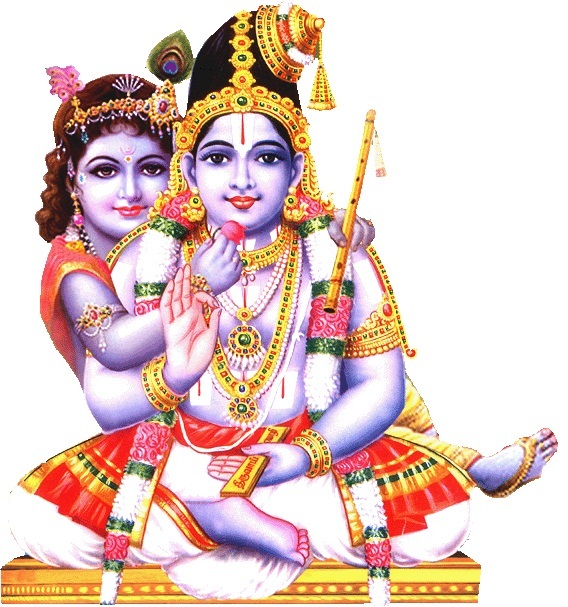 nammAzhwAr says in thiruvAimozhi 4.8.5 “aRivinAl kuRaivillA agalgyAlaththavar aRiya neRiyellAm eduththuraiththa niRai gyAnaththoru mUrththi” (For those persons who reside in this world and who don’t realize that they are short of wisdom, emperumAn who is omniscient explained all the different means in the most crisp manner). thirumazhisai AzhwAr says in nAnmugan thiruvanthAdhi 71 “sEyan aNiyan siRiyan migap periyan Ayan thuvarikkOnAy ninRa mAyan anRu Odhiya vAkkathanaik kallAr ulagaththil EthilarAy meygyAnamil” (Being unreachable at the same time easily approachable, being a small boy at the same time being great – emperumAn who appeared as a cow-herd boy (having simplicity) at the same time being the emperor of dhvArakA (having greatness), during the mahAbhAratha war, blessed the gIthA (mainly charama slOkam). Those residents of this world who do not learn that divine work will be considered as ignorant enemies of bhagavAn. It is that same gIthAchAryan, who is lying down in srIrangam as srIranganAthan. Considering the great value of bhagavath gIthA, ALavandhAr compiled gIthArtha sangraham – a set of skOkams outlining the philosophy explained in gIthA. thirukkOshtiyUr nambi, one of the main sishyas of ALavandhAr, explained the essence of gIthA charama slOkam to srI rAmAnuja. In course of this incident, srI rAmAnuja revealed the meanings of the charama slOkam to those who desired for the same and was thus anointed with the title “emperumAnAr” (my great master) by thirukkOshtiyUr nambi himself – mAmunigaL explains this incident in piLLai lOkAchAryar‘s mumukshuppadi – charama slOka prakaraNam (section) avathArikai (introduction). emperumAnAr subsequently wrote gIthA bhAshyam – an elaborate commentary for bhagavath gIthA. 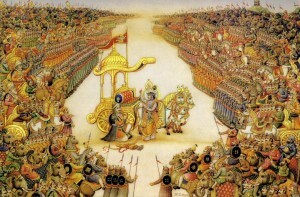 emperumAnAr explained gIthA in its purest form, keeping the dhivya prabandham and AzhwArs‘ divine emotions in his mind. This is very easily understandable from the commentaries given by him for many of the slOkams. mAyan – Ascharya bhUthan (one who is amazing) – By being the charioteer, he demonstrated his Asritha pArathanthriyam (being submissive towards his devotees) to the whole world. anRu – that day when arjuna became so perplexed and dropped his bow/arrow and said to krishNa that he was completely helpless and was fully surrendered to him. In srIvachana bhUshaNa dhivya sAsthram, piLLai lOkAchAryar explains in the beginning itself that mahAbhAratham reveals the principle of bhagavAn being the only means to attain him. mAmunigaL explains the full essence of gIthA in the vyAkyAnam for the 6th sUthram of this divine grantham to explain emperumAn’s act of assuming the role of AchArya. vAdhi kEsari azhagiya maNavALa jIyar (a sishya of periyavAchchAn piLLai and nAyanArAchchAn piLLai) compiled a thamizh prabandham named “gIthai veNpA” – each slOkam of gIthA is translated in to beautiful thamizh verses in the poetic meter of veNpA. vEdhAnthAchAryar have written a tIkA (annotation/detailed commentary) named thAthparya chandhrikA for srI rAmAnuja’s gIthA bhAshyam. He also authored a thamizh prabandham named gIthArtha sangraham (which is similar to ALavandhAr’s samskritha gIthArtha sangraham) explaining the principles of gIthA in short. Old English words such as thou, thy, etc., will be replaced with contemporary equivalents such as you, your, etc. Complex sentences will be reconstructed by reordering words, etc., so they are easier to follow. sanskritha slOkas in dhEvanagari script followed by Roman transliteration will be included. The original (1898) edition included only the first sentence of each verse in dhEvanagari script to conserve space and keep printing costs low. The original (1898) edition included copious notes and references in footnotes. Only those notes and references that would help the beginner reader have been included in this initial attempt. To write the word-by-word meanings for the gIthA slOkams, we will be using the thamizh translation of the same by puththUr krishNamAchArya (krishNaswAmy iyengAr). While the simplification of ALkoNdavailli gOvindhAchArya swamy’s translation would be performed by srIvEnkatEsa rAmAnuja dhAsan, puththUr krishNamAchArya’s thamizh translation will be rendered in English by sArathy rAmAnuja dhAsan. Seeking the blessings of srIman nArAyaNan, AzhwArs and AchAryas, we begin this effort for the pleasure of kaNNan emperumAn and his devotees.